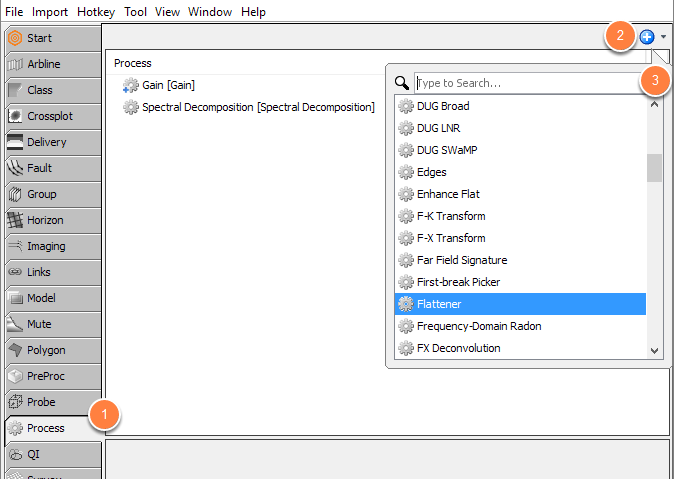 Processes in Insight range from band-pass filtering to model building and all the way to spectral decomposition. The results of most processes in Insight are “Process Volumes”, but there are a few exceptions (e.g. AVO Polynomial Fit, Pick Multiple Horizons, Flattener). Only the data required for display is calculated. Parameter changes take place immediately; the display is updated "on the fly". Appear in italics in the Volume tab. Can be used as inputs to other processes (as standard volumes). Can be exported (.dugio, SEG-Y) (as standard volumes). Because process volumes are generated on the fly, parameter updates take place immediately. Furthermore, only the data required to update the display is calculated. This makes it fast and efficient to compare and evaluate changes to inputs and parameters. Note: If you intend to use the process result regularly, you should export the volume to disk (see Exporting a Volume to DUG I/O). This becomes more important when examining the result of multiple processes that are chained together. You can then use the volume without a performance penalty from processing the data on the fly. Search for the process or scroll to look for a particular process. Double-click the process and assigned a name. Click OK to add process to the panel. 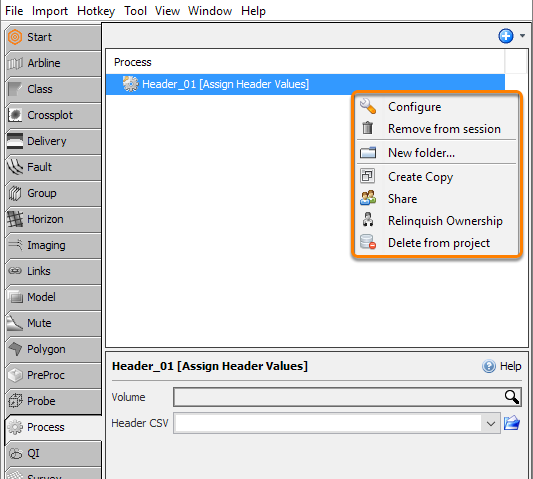 New folder: Create a folder in the process panel. Existing process can be drag-and-drop into the folder. Create copy: Create a duplicate of the process. Share: Share process with other session users. Relinquish Ownership: Remove ownership of the process for the current session user. For info about ownership, see Multi-user Considerations. Delete from project: Remove process from the project.